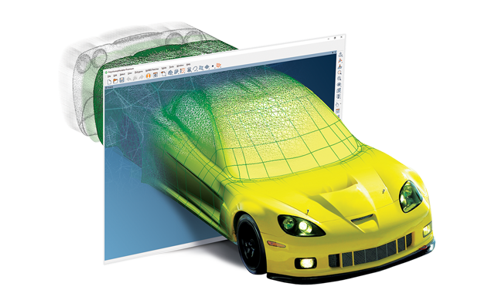 PolyWorks|Modeler is a comprehensive reverse-engineering software solution that allows extracting optimal CAD entities - curves, surfaces, parametric sketches, and prismatic features - from polygonal models of digitised parts to serve as the starting point in your professional CAD modelling solution. A first set of tools is designed to repair and optimise imperfectly digitised geometry. For example, it may be necessary to interpolate new polygons over unmeasured areas to create a complete surface representation. 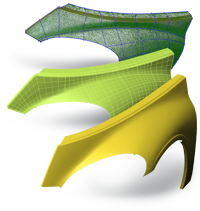 A second set of tools offers CAD operations on polygonal models, such as extrusion, offset, fillet, and Boolean operations. PolyWorks|Modeler offers an intuitive surfacing approach in which curves are first laid down on a polygonal model, and then automatically intersected to form four-sided or N-sided trimmed NURBS patches. Next, the NURBS patches are used to control the fitting of a continuous network of NURBS surfaces. 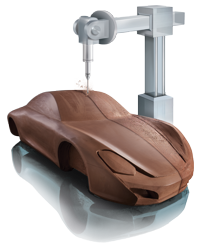 Fitted surfaces can then be exported to IGES or STEP files and directly imported into your favourite CAD/CAM application for further processing. PolyWorks|Modeler's NURBS surfacing technology offers a remarkable balance between lead time and surface quality. 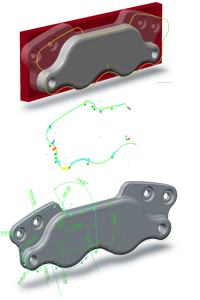 The solid modeling philosophy of PolyWorks|Modeler consists in optimising the extraction of geometric entities on digitised polygonal models, and then transferring these entities to your corporate feature-based solid CAD modeler to guarantee the creation of parametric, associative, and fully editable solid models. from InnovMetric Software Inc is offered with each purchase of a new or used FARO digitizers.